The top photo is the clear winner. The MT-24EX has detachable heads, and what I did here was remove one of them and hand-hold it under the leaf, facing upward at the ant. This backlighting illuminated the leaf from below, giving it that lively green glow. 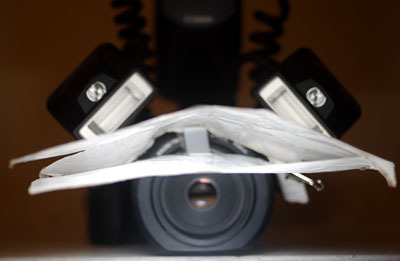 The other head remained on the camera and was diffused by a double layer of tracing paper. The bottom photo was taken a few minutes earlier using my standard diffuser with both heads mounted on the camera. 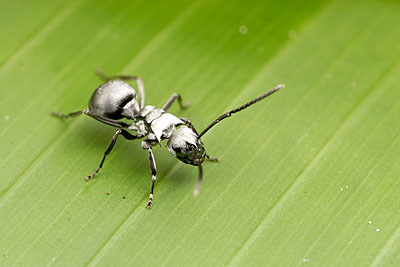 While the diffuser really brings out the silver reflections on the ant, the diffused flash also reflects off the surface of the leaf and obscures the richness of the green. In an earlier post about flash diffusion, I wrote about camera flash being a necessity of the trade-off between depth of field and shutter speed. Most insect photographers- myself included- work hard to improve the depth of field in our photographs, trying to bring as much of our diminutive subjects into focus as possible. This means we use a lot of flash. However, that’s not the only way to take insect photos. If one is happy to throw depth of field to the wind, one can dispense with the need for flash and produce photos from the ambient light. The effect is dramatic. One doesn’t get crisp field-guide type pictures but smooth, watery, impressionistic images. Some fine examples of taking insect photography in that direction can be found at the site Bug Dreams. 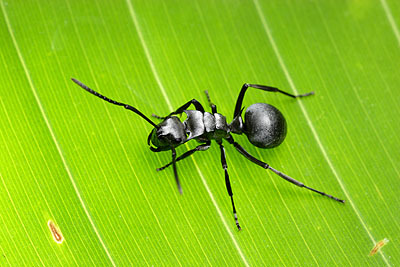 In particular, check out Rick’s lovely shots of ants.